Donald Ross receives his award from Rural Economy Secretary Fergus Ewing. 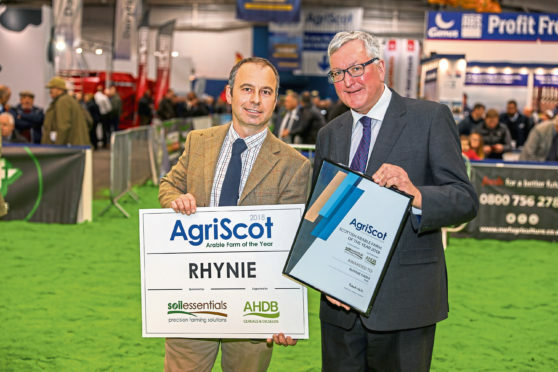 Donald Ross, of Rhynie, Tain, has won the Agri-Scot Arable Farm of the Year award thanks to his detailed understanding of costs, passion for collaboration and zeal for soil health. Donald owns and runs a mixed unit with 346 acres of cropping, and his attention to detail led him to gold and silver Yen awards last year for a field of Viscount wheat which yielded 6 tonnes per acre. Using genetics and EBVs as a driver for flock improvement and prime lamb production helped the McGowan family at Incheoch, Alyth, Perthshire, to win the Sheep Farm of the Year award. Neil and Debbie McGowan run 1,100 Lleyn ewes along with a suckler herd on 1,200 acres at the foot of Glenisla. They operate a low-cost sheep system, focusing on maternal characteristics for the ewes and enhancing commercially relevant traits. Bielgrange near Dunbar, run by Niall Jeffrey in partnership with his father Angus, received the Beef Farm of the Year award. The Jeffrey family run two spring-calving herds over three farm units. The 740-acre lowland Bielgrange and 593-acre upland Weatherly Farm run 250 Aberdeen Angus cross sucklers. The business also contract-farms 160 Angus cross suckler cows. Lastly, the Dairy Farm of the Year award was presented to brothers Alistair and Hugh Watson, Laigh Tarbeg, Cumnock. They milk a flying herd of 200 Holsteins which are inseminated with beef DNA to add value to calves. Assessor Gilmour Lawrie said: “Laigh Tarbeg is a case study in how innovative technology, such as robotic milking, feeders and shed scrapers, can be used to take the drudgery out of routine chores.